The act of reaching out to vulnerable children and changing the course of the lives for the better is what ChildFund seeks to do. Sometimes the ripple effects can be profound..
“How far that little candle throws his beams! So shines a good deed in a weary world.” – William Shakespeare. About 25 years ago, when he was a boy, Makeshwar Rawat served food in a roadside hotel in the Jamui district of Bihar, India. He was a child labourer, and so was his friend Rajesh, who worked as the masalchi, or kitchen helper, preparing spices. One day, two staff members from ChildFund’s local partner organization Parivar Sevar walked in, and Makeshwar’s and Rajesh’s lives changed forever. Once connected with ChildFund, the boys received sponsors, enrolled in school and eventually obtained good jobs. But Makeshwar and Rajesh never forgot where they came from. In their free time, the young men began visiting outlying areas in their district, trying to understand the poverty there. They came to believe that lack of education and opportunities for community engagement were big factors; so, together with two of their friends, Kumud and Bhola — also former child labourers and ChildFund-sponsored children — they began to organize community meetings. The meetings took on a life of their own. Makeshwar and Rajesh decided to leave the security of their jobs and focus on community work. In 1999, the four friends formed Samagra Seva, a nonprofit organization that is dedicated to helping children and families in their home district of Jamui. The organization, whose name loosely translates to “complete service,” became registered by the government in 2001, and since then, its education and health efforts have helped transform the lives of thousands of children. Samagra Seva has partnered with NGOs such as the National Foundation for India (NFI) and UNICEF, among others. In 2006 and 2014, the nonprofit was recognized nationally by NFI for its work promoting children’s rights among the marginalized and oppressed Dalit — once known as “untouchables” — and tribal communities. This past summer in New Delhi, Makeshwar shared his background at ChildFund’s launch of the second phase of the Books, My Friends program to improve child literacy throughout India. In the first phase, ChildFund donated books and tote bags to children to encourage them to read for pleasure; the second phase focuses on removing one of the barriers to reading by providing solar lanterns to children and families in rural areas without electricity. 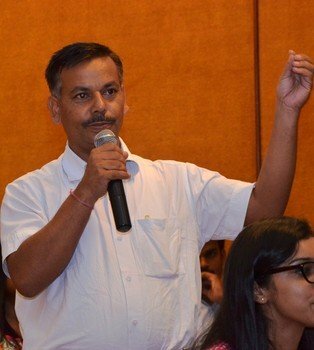 Had he and his friends not been sponsored by ChildFund, Makeshwar said, “we all would have ended up as daily wage laborers.” Instead, inspired by the Books, My Friends campaign, he has been able to donate, through his organization, solar lanterns to 30 adolescent girls from the Dalit and tribal communities of Jamui. Samagra Seva also committed to donate lanterns for 50 more girls in the district. Who knows what good may come from sponsoring a child? We often don’t realize how our deeds might reverberate in the years to come. Surely, the two people who walked into a roadside hotel in Jamui on that long-ago day never dreamed what the two boys they encountered there would come to do, how far that little candle would throw its beams.